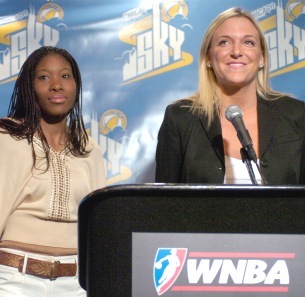 NEW YORK, NOV. 16, 2005 – The WNBA’s newest franchise took its first step toward assembling its inaugural roster, as the Chicago Sky announced the 13 players it selected in the 2005 Expansion Draft. The list includes Jia Perkins (Charlotte Sting); Brooke Wyckoff(Connecticut Sun); Elaine Powell (Detroit Shock); Kiesha Brown (Houston Comets); Deanna Jackson (Indiana Fever); Laura Macchi (Los Angeles Sparks); Stacey Lovelace (Minnesota Lynx); DeTrina White (New York Liberty); Ashley Robinson (Phoenix Mercury); Bernadette Ngoyisa (San Antonio Silver Stars); Chelsea Newton (Sacramento Monarchs); Francesca Zara (Seattle Storm); and, Stacey Dales-Schuman (Washington Mystics). In addition, the Chicago Sky owns the sixth pick in each round of the 2006 WNBA Draft. General Manager and Head Coach Dave Cowens, President and CEO Margaret Stender and two of the Sky’s newest members, Wyckoff and Jackson, will be available this afternoon for interviews via a media conference call at 2 p.m. ET. Chicago had the right to acquire one player from each of the 13 WNBA teams. Each team had designated a maximum of six players who would not be available for selection in the Expansion Draft. The Sky joins the Charlotte Sting, Connecticut Sun, Detroit Shock, Indiana Fever, New York Liberty and Washington Mystics in the Eastern Conference. 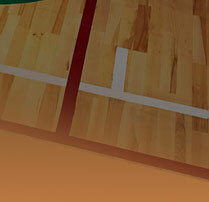 Home games will be played at the UIC Pavilion, located on the campus of the University of Illinois at Chicago. Season tickets for the team’s 17 home games and two preseason games are on sale now and can be purchased by calling (877) 329-WNBA or on-line at the team’s Web site www.chicagosky.net. In 2005, the WNBA concluded its ninth season with an action-packed WNBA Finals that crowned a new champion for the third straight year as the Sacramento Monarchs defeated the Connecticut Sun. The WNBA Finals on ESPN2 produced significant increases in ratings (+33 percent) and viewership (+27 percent) versus 2004. As the preeminent women's sports league, the WNBA is the destination for the best women's basketball players in the world. * Denotes a restricted free agent, meaning that Chicago will have the right to match any offer the player receives for the upcoming season.